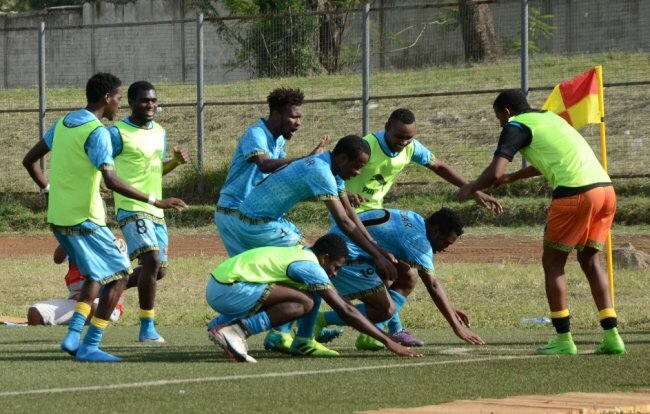 Zanzibar made it into their first CECAFA Senior Challenge Cup final in two decades after beating Uganda Cranes 2-1 in the semi-finals on Friday evening in Kisumu. The emotions on the pitch were high, players crying, others soaking their coach Suleiman Hemed with water as they celebrated the fete. Mohammed Issa Juma scored the winning goal from the penalty spot in the 55th minute. Uganda had to finish the rest of the match with 10 men after Joseph Nsubuga was sent off for pulling Ibrahim Hamad inside the box resulting in the penalty. Moses Basena, the Uganda Cranes coach was left angered with the performance of his players, saying Zanzibar deserved to win. “It is disappointing as defending champions not to be in the final but we have ourselves to blame. We conceded both goals off our own mistakes. We tried to push but credit to Zanzibar because they were very disciplined in defense,” Basena said. Abdul Aziz Makame opened the scoring for Zanzibar in the 23rd minute before Uganda equalized six minutes later through Derrick Nsibambi who scored his fourth goal of the tournament. Uganda were without the suspended duo of Timothy Awany and Isaac Muleme after both received red cards in their final group match against Ethiopia. Zanzibar missed left back Haji Mwinyi who was serving suspension after accumulating two yellow cards while Suleiman Mohammed missed with injury. The island nation had the first chance of the game in the seventh minute when Adeyum Seif’s freekick kissed the outside of the bar. In the 11th minute Nsibambi went for the spectacular with an acrobatic kick off a Nico Wadada cross but the effort went over. Against the run of play, Zanzibar went ahead. Makame found the ball inside the box from a poorly defended corner to shoot home. Uganda had given away possession cheaply resulting in the corner. Ibrahim Hamad won the ball off Geoffrey Madoi before breaking into the box with his shot turned behind by keeper Isma Watenga. The goal immediately bolted Basena into action, pulling out Shafiq Bakaki who had struggled in his first start of the tournament and brought in Nsubuga. Uganda drew level four minutes later when Nsibambi swinged in his fourth goal of the tournament from Allan Kyambadde’s cross. In the second half, Uganda came back stronger but were caught up in the counter resulting in what would be Zanzibar’s winning goal. The Cranes lost possession cheaply from their own corner and Zanzibar took on the counter. Hamad broke away with pace and once he was inside the box preparing to place the ball into the net, he was pulled down by Nsubuga. Issa stepped up and made no mistake, sending Watenga the wrong way. In the 70th minute, Uganda should have drawn level. From a Kyambadde cross on the left, Nelson Ssekantuka chose to chest down the ball instead of going straight for a header, allowing Zanzibar to clear their lines. Zanzibar keeper Mohammed Abdulrahman pulled a great save two minutes from time when he punched away a shot from Nsibambi. Even with four added minutes, Zanzibar defended with their hearts to ensure they get to their first final since 1995.